Back then I introduced you to Peter Hill, a former lighthouse keeper who has published a book about his experiences called Star of the Four Kingdoms. 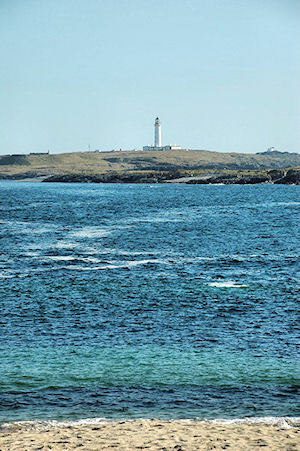 Peter worked at Rhuvaal lighthouse in the north of Islay as well as the Rinns of Islay (or Rhinns of Islay if you prefer) lighthouse on Orsay towards the end of his career. Earlier today I found a page on the BBC Scotland site titled A lighthouse keeper's tale. The lighthouse keeper in question is of course Peter and we can learn more about his experiences. The report covers his whole time with the lighthouses at Killantringan, Sule Skerry, Ruvaal, Barra Head, Holburn Head, Inchkeith, Mull of Galloway, Ailsa Craig, Islay and the Rhinns. Islay receives a few mentions and it's an interesting read in general. And there's more: Follow the link to In Pictures: Lighthouses and click through the pictures. I can't seem to link to individual pictures, but pictures number 3, 4 (I think) and 5 are from Islay.